Product and ordering information for VACUU-LAN Mini-Network. Perform up to three applications with a single vacuum pump. 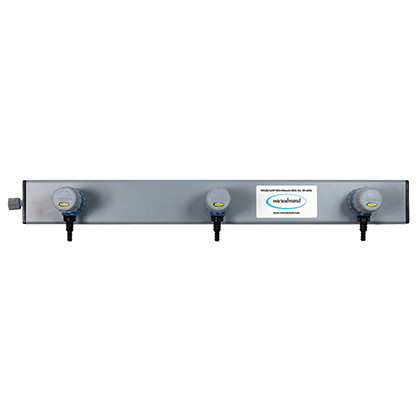 Three vacuum ports mounted onto a bar; each port with flow control and integrated check valve. Increase the utility of your oil-free diaphragm vacuum pump with VACUUBRAND's innovative VACUU•LAN® Local Vacuum Network. With the new VACUU•LAN® Mini-Network, you can install three VACUU•LAN® ports in a snap! 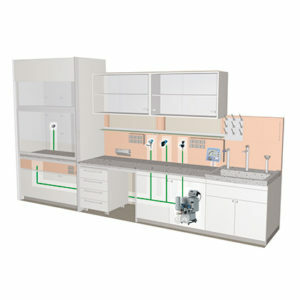 Just attach the assembly to the wall or your lab frame, connect the pump with vacuum tubing, and you're ready to go! Individual ports are check-valve-controlled to minimize interference between applications. Ports include manual flow control for continuously variable pumping speed adjustment. Coupled with the 100mbar ME 1 or ME 1C pumps, you have an instant filtration network. Alternatively, choose a 7 mbar or 1.5 mbar VACUUBRAND® chemistry pump to support more demanding applications. Higher flow-rate pumps can support two VACUU•LAN® Mini-Networks at once, and pumps with deeper vacuum capacity will assist with evaporative applications. When using the Mini-Network for evaporations, ask about our pumps such as the PC 201 NT. They offer inlet catchpots to protect your pump from line condensations, and emissions condensers to trap waste vapors for environmental control or for proper disposal. ⚠ WARNING – This product can expose you to chemicals including Carbon black (airborne, unbound particles of respirable size), which is known to the State of California to cause cancer, and Di-n-butyl Phthalate (DBP), which is known to the State of California to cause birth defects or other reproductive harm.